I am working on a series of OWSM related posts. This one talks about the OWSM key store and credential store. Specifically, this post mostly talks about the physical aspects of the stores: where the files are, how to use UI to find and manage them. I will cover how to generate, export/import, work with aliases of keys and certs etc. OWSM's key store and credential store are always mysterious to me. As i get better understanding them, i'm recording what i have learned. By default, OWSM key store (also referred to as OWSM agent's key store) is here: "<domain home>/config/fmwconfig/default-keystore.jks". The actual location can be found in this file: <domain home>/config/fmwconfig/jps-config.xml. 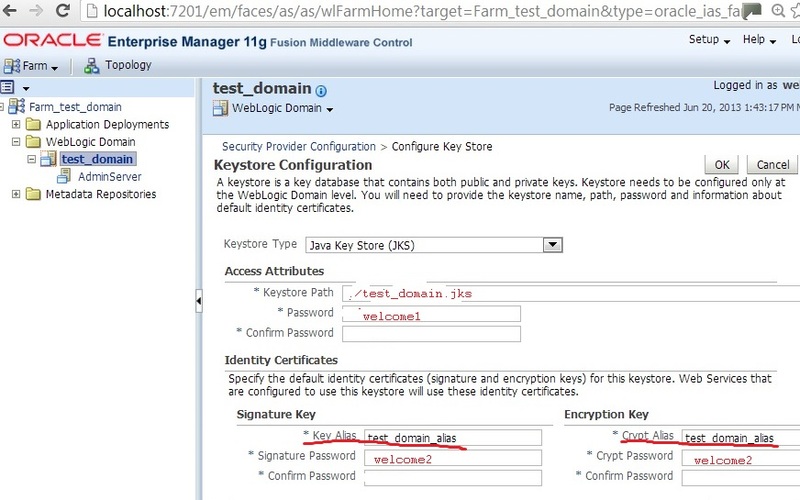 You can configure the keystore from the "em" console, expand "Weblogic Domain" on the left, then right click your domain, select "security", then "security provider configuration", and on that page, click "configure" button under the "Keystore" section. There are many key stores in SOA suite. This one is for OWSM. It uses the certificates in the store for encryption/decryption when processing OWSM security policies. Do not confuse this keystore with the ones for Weblogic server. Those are under Weblogic console->"Environment"->"servers"-> "your server", then under the "Keystores" tab. You will see at least two "identity" and "trust" stores. Those stores contain certificates mostly for the server SSL among other things. 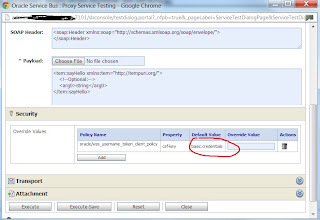 it will prompt you for your name, location etc, then it will generate a test_domain.jks file. This file contains public/private keys that can be used for encryption/decryption. The key alias is "test_domain_alias" (pay attention to this alias, as it is related to the credential stores we'll discuss). The keypass (for test_domain_alias) is "welcome2". The keystore password is "welcome1", which is used to access the store file. 3650 will make key valid for 10 years! 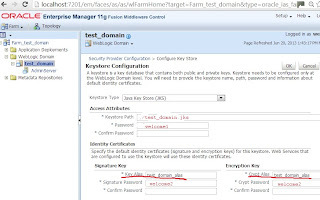 For example, keytool -list -v -storepass welcome1 -keystore test_domain.jks, will display the certificate contained in the key store. Please note that we used test_domain.jks as the keystore path, the password is "welcome1". 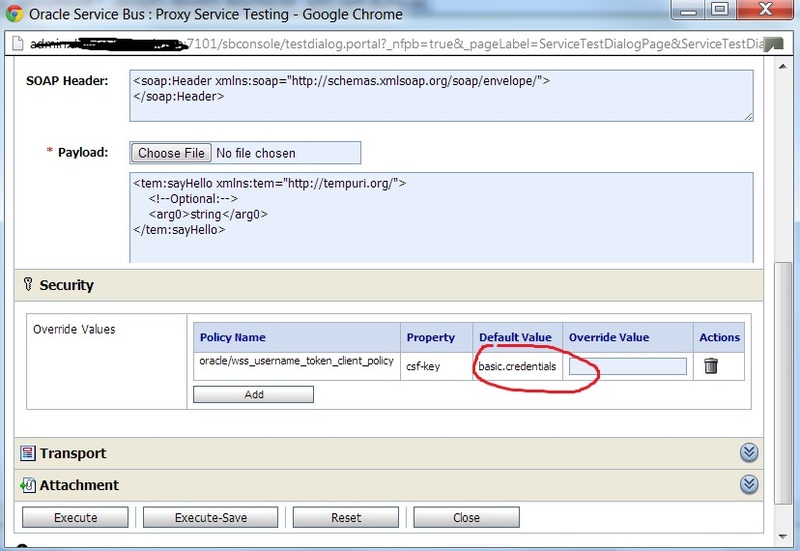 For Signature and Encryption key alias, we entered "test_domain_alias". We use "welcome2" for both passwords. Please be careful that the editor doesn't validate anything you enter here other than "password and confirm password" are the same. You can enter wrong jks name, wrong passwords, and wrong alias, it would just same them as-is. I guess you'll find out things are not working at run time if you saved incorrect information. So where is all the information you entered stored? They all went to the credential store. I believe the physical file is cwallet.sso, it's a binary file, you can't see much of it. What is the credential store then? Well, all I know is that it stores some "credentials", such as user name and password. Each entry has a key. The overall credential store is organized by "maps". 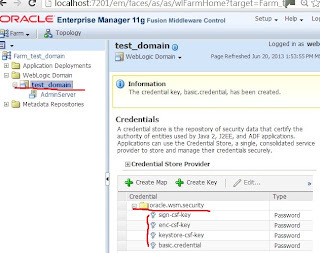 If you already configured the key store as above, you will see at least one "oracle.wsm.security" map, under the map, you'll see at least 3 keys: sign-csf-key, enc-csf-key, and keystore-csf-key. These are populated when you configured the keystore. If you change them here (for example, edit sign-csf-key, try change the value from "test_domain_alias" to something else), and you go back to the keystore configuration, you'll notice it is updated over there as well. Again, it's garbage in garbage out, whatever you enter, it would be saved as-is. It's your responsibility to enter the info correctly. If you go to the extreme and delete the oralce.wsm.security map here, then go the keystore configure, you'll see the data is wiped out over there and you'll have to reconfigure the keystore. BTW, how does OWSM know to use these 3 special keys to access the store. If you open fmwconfig/jps-config.xml, you'll find them there. That's quite enough about these 3 keys! Let's look at the other key i created manually, "basic.credentials". Under the key i have user name "weblogic", password "welcome1". 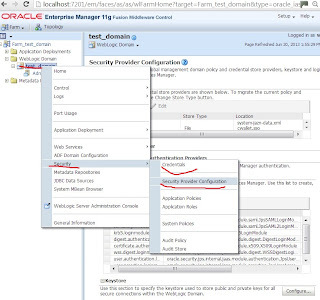 This is typically used like a "service account", if a BPEL or OSB business process need to invoke another service and provide a service account, you can simply reference "basic.credentials" under oracle.wsm.security. It just so happened that several OWSM security policy reference this particular key "basic.credentials" by default. 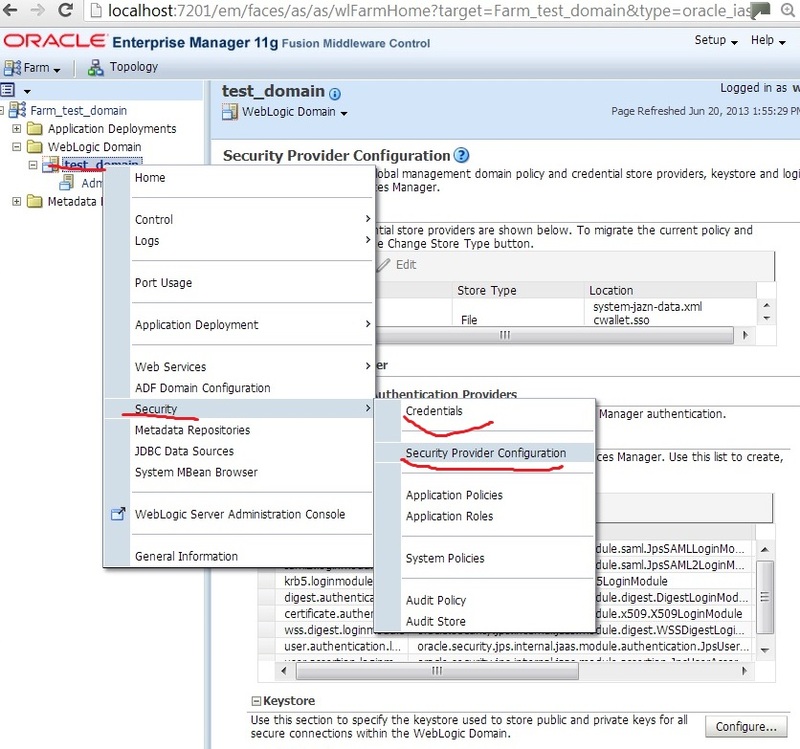 For example,if you have oracle/wss_username_token_service_policy on a proxy and run the test console on the proxy, you'll see it uses "basic.credentials" by default. I think oracle/wss_username_token_client_policy does the same, at least for SOA client, it uses "basic.credentials" for user/pass if you don't explicitly specify them in your code.If your key name is something different, then your process needs to reference the other name.